The boss of Britain's biggest housebuilder is going out on top. As all good CEOs (well, ones with an eye on their reputation anyway) know, it’s best to leave the job on a high. And it looks like Barratt Developments boss Mark Clare is following the playbook to the letter, stepping down after nine years having dug the housebuilder out of the depths of the recession. The 57-year-old is leaving in July (although staying in the company until October ‘to ensure an orderly handover’) to ‘develop his non-executive career,’ a rather limp-sounding reason if we’ve ever heard one given independent directorships don’t exactly set the world alight. Unless of course Clare, currently the senior independent director at United Utilities, is ‘gunning for a chairmanship,’ which would probably be more accurate. Clare is being replaced by David Thomas, who has been Barratt’s finance director since 2009, after five years as finance boss and deputy chief exec of retailer Game. The company was also keen to let everyone know that the 52-year-old has four children with his wife of 26 years and likes golf and fishing. How nice. The pick got the nod of approval from Deutsche Bank analyst Glynis Johnson, who called it an ‘orderly succession’ to ‘a steady pair of hands’. And investors seemed happy enough with Thomas too – shares often fall after a long-standing leader leaves, but they were up 1.3% to 544p in mid-morning trading. But Thomas still has some big shoes to fill. Clare has overseen a 33% increase in the FTSE 100 company’s share price in the last year (although it still hasn’t recovered its pre-recession peak of 1,260p) and pledged to return £1bn to shareholders over the next three years. 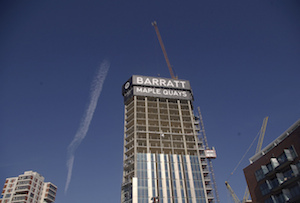 Pre-tax profits jumped 75% to £210m in the half year to December 31 as Barratt cashed in on in an era of low interest rates and rising house prices. But while the Bank of England doesn’t look like it’s going to do anything about the former, the housing market has come off the boil of late. Nationwide data out today showed UK property prices rising 5.1% annually in March, an 18-month low. Meanwhile, several brokers have downgraded Barratt, Britain’s biggest housebuilder, recently, pointing out its relatively high debt and low margins. The foundations Clare is leaving behind may not be quite as solid as Thomas would have liked.